As I ride my Dead Ped Honda threw the small alleyways and roads of Seoul i find I listen to certain songs more than others. I though it would be nice to compile all these songs into a list and see if people might be listening to the same thing. Then again, I guess this could all be personal preference. These are in no particular order, it just how I find it on my MP3 Player. Here is my list if you think that you might have some decent songs to add to the list just leave them on the comments. I am always looking for new material to listen to while riding. 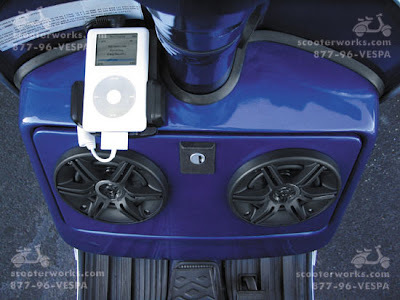 And whilst were on the subject you might want to look at getting a Ipod carrier for your scooter or moped. 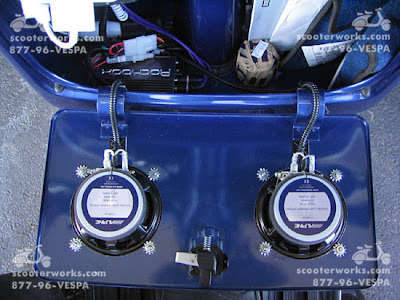 You can buy systems like the one featured Below or make your own, which is what I did for my Stella back home. It cost 50.00 after all was said and done. Including the Radio/Audio hook up from Ebay, Wiring, Speakers, and a Samsonite Travel case from a Goodwill Store. You can buy the whole system already fitted and put together for you all you have to do is screw on a few nuts and bolts here and there or. Do it yourself, you will have more respect when you figure out how the entire thing works and you can say you created it. Just so you know you can Buy This through Scooterworks.com I have dealt with Scooterworks many times in the past and i must say that there customer service is fantastic.